my little red suitcase: the autumn equinox and a little crafting! the autumn equinox and a little crafting! Hello there, I've finally made it back here..... a week has gone by, a much improved week at school, for my teen, by all accounts. Flying high in fact on some days, only to crash and burn a bit today....., thank goodness it's friday! 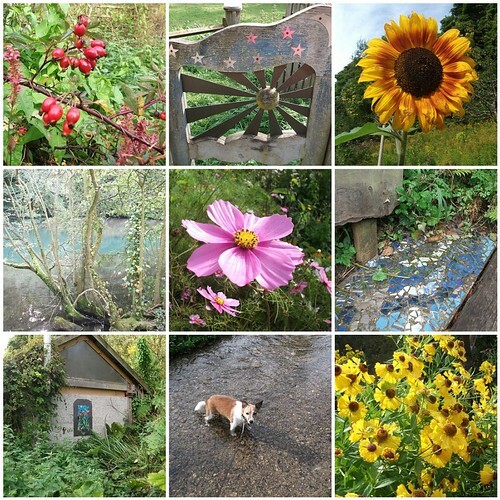 Here are some photos of a little end of summer, beginning of autumn walk I went on this week. Feeling a little free I went for a wander through a place I used to visit a lot, but haven't passed by for a while. 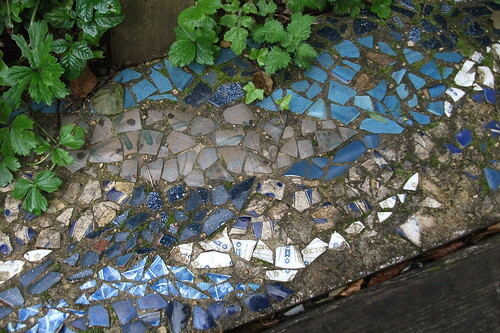 These photos are taken at a place called Ruskin mill college. Set in a beautiful lush valley in the Cotswolds. It's a college for 16 to 25 year olds who have a range of different learning difficulties. Coming from all over the country, they live with house parents in their family home and come to the college to learn a range of different skills from growing vegetables, to farming, iron work, clay work and woodwork. 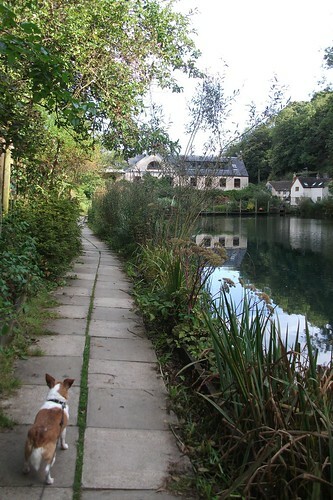 You can walk through the valley, alongside the beautiful clean fresh lakes, it's very rejuevinating and inspiring. Seeing art and sculptures by the students at every turn as you walk through. 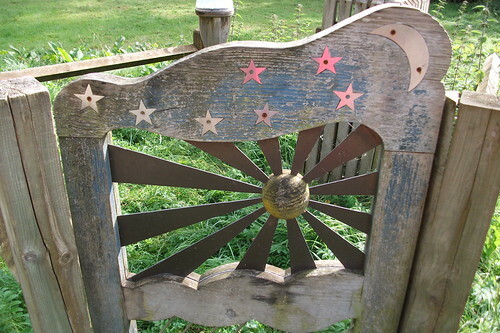 I've always loved the wooden weather station door with it's sun and stars, and the blue mosaic work on the bench, such a nice idea. 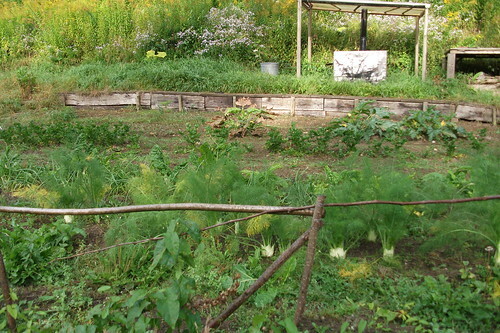 It's so nice to see a flourishing vegetable and flower garden at the end of summer. I can only hope that next year I might find a bit more time to encourage mine to look like this! it's all grown organically and the food is served in the scrumptious cafe at the college. I had a gorgeous slice of carrot cake with icing on the top, and a latte. It just had to be done. It's such a pretty time of year, everything so full and ripe. The sun and the stars are bringing us into alignment and balance and in the northern hemisphere, into the autumn equinox. Now we will begin to turn inward and the last of our summer plans are brought into fruition. Not exactly a very summery summer, I'm a bit sad to see that I have no apples on my tree.....or plums! actually I had one and it was like a sacred apple, it tasted delicious too...... It's such a shame, apples are my very favourite food and I eat so many. If in doubt have an apple, that's what I say! or chocolate or both!! I'm definitely rambling and I wanted to show you my little crafting moment. Inspired by this lady in this months Country living. Just pretty straight forward and self-explanatory I would say. I sewed a little brooch pin on the back. It was nice to use the different colour felts combined with the vintage sheet fabric. Just a little something to keep the crafty clogs turning! 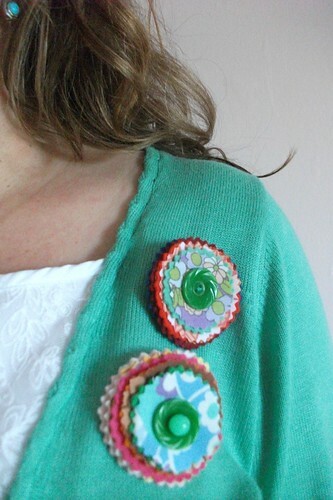 I love the vintage buttons and the colour of that bead, lots of possibilities! Okay, perhaps wearing two at once is a bit much! These would also be nice pinned on a bag, or a coat, or perhaps big giant ones! Well I wish you all a happy equinox and hope that all your fruits and plans are ripening! or just beginning to burst forth if you are in the southern hemisphere! I have been working on my etsy shop and I hope to be able to show you soon. I am just working out the details. I haven't put a link up yet, but it's there. Oh and enjoy the weekend! what anise place to walk trough!!!! What wonderful photos, the college sounds amazing. I saw those corsages as well, really want to try some! Lovely photos, looks like a beautiful place for a walk. Autumn has arrived! have a lovely weekend. What beautiful and inspiring place. Thanks for sharing. Would that we had someplace that served carrot cake and creamcheese icing. Sigh. Looking forward to your shop reveal! Lovely post, Heather. How lucky to be surrounded by such beauty there in the Cotswolds. 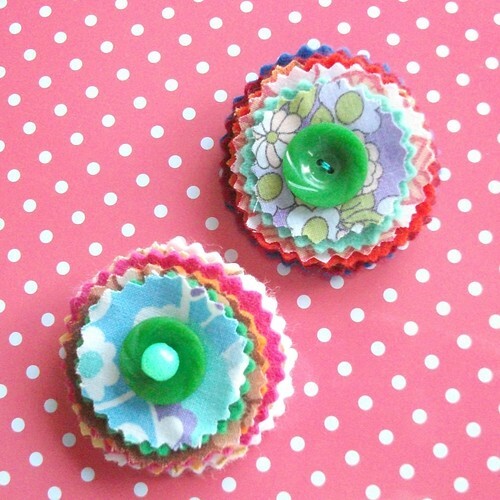 Cute and fun brooches!! I adore this garden....so magical.